Sensory programs, including incorporating weighted items that provide deep pressure therapy, have been documented as reducing the incidence of the need for seclusion and full restraint episodes up to 12 months after introduction, as well as increasing the energy and arousal of patients (Bobier, et al, 2015). The creation of a sensory modulation room appears to be a worthwhile endeavor in aiding both children and adolescents admitted into a psychiatric hospital to manage stress and agitation, as well as aid efforts at reducing seclusion and restraint in this population. The use of a weighted vest, such as the OTvest™, can be a useful, easily applied, effective part of a sensory modulation program within a mental health environment. The OTvest™ provides deep pressure therapy to the upper back and shoulders of the wearer. It is an easily applied sensory strategy that does not require going to a specific sensory room. Some patients avoid the one-on-one time that these rooms require; which is why the OTvest™ can be beneficial in these circumstances, as this weighted vest can be a gentle intervention, worn in a variety of areas. The OTvest™ can be worn independently, in the dining room, during therapy sessions, free time, before going to bed to reduce sleep difficulties, and in the community. The OTvest™ does not require intensive staff training, unlike many other sensory programs. Staff training difficulty has been identified as the reason that some sensory programs may be less effective (staff days off, change of staff, missed training sessions, etc.) And the OTvest™ weighted vest not only can be an effective intervention on its own, but can be combined with other sensory strategies to amplify effectiveness. The weighted vest can be incorporated into a patient’s sensory or calming strategy, both inside and outside of the acute setting. The OTvest™ is stylish and non-stigmatizing. 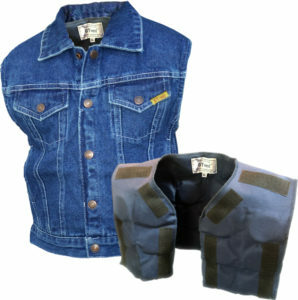 The weighted vest is appropriate for both sexes, all ages, and is perfect for community integration. Unlike a weighted blanket, or compression vest, the OTvest™ can be used for multiple wearers due to the ease of disinfection of the garment. The nylon cordura of the weighted vest only needs to be wiped down between wearers, and the vest simply needs to be laundered. Compared to a weighted blanket or compression vest, the OTvest™ is far easier to completely clean. The OTvest™ is an extremely durable, quality made garment, and is a good economic choice for department budgets--lasting many years of daily wear. Ashby, M., Lindsay, W., Pitcaithly, D., Broxholme, S., & Geelen, N. (1995). Snoezelen: Its effects on concentration and responsiveness in people with profound multiple handicaps. British Journal of Occupational Therapy, 58, 303-307. Ayres, A.J. (1979). Sensory integration and the child. Los Angeles: Western Psychological Services. Bobier, C., Boon, T., Downward, M., Loomes, B., Mountford, H., Swadi, H. (2015). Pilot investigation of the use and usefulness of a sensory modulation room in a child and adolescent psychiatric inpatient unit, Occupational Therapy in Mental Health, 31,4, 385-401. Brown, C. (2001). What is the best environment for me? A sensory processing perspective, Occupational Therapy in Mental Health, 17 (3/4), 115-125. Champagne, T. (2011). The therapeutic use of weight, Sensory Modulation & Environment: Essential Elements of Occupation. Pearson. Champagne, T., Stromberg, N.,(2004). Sensory Approaches in Inpatient Psychiatric Settings: Innovative Alternatives to Seclusion & Restraint. Journal of Psychosocial Nursing, 42, no. 9. Krauss, KE, (1987). The effects of deep pressure on anxiety, American Journal of Occupational Therapy, 41: 366-373. ¹ McNett, M., Sarver, W., & Wilczewski, P. (2012). The prevalence, treatment and outcomes of agitation among patients with brain injury admitted to acute care units. Brain Injury, 26, 1155-1162. Mullen, B., Champagne, T., Krishnamurty, S., Dickson, D., Gao, R., (2008). Exploring the Safety and Therapeutic Effects of Deep Pressure Stimulation Using a Weighted Blanket, Occupational Therapy in Mental Health, 24, 65-69. Novak T, Scanlan J, McCaul D, (2012). Pilot study of a sensory room in an acute inpatient psychiatric unit, Australian Psychiatry, 20: 401–406. Sutton, D., Wilson, M., Van Kessel, K., Vanderpyl, J., (2013). Optimizing arousal to manage aggression: A pilot study of sensory modulation, International Journal of Mental Health Nursing, 22, 500–511.